Please visit our fabulous sponsor this week, Lemon Shortbread, to see all of their wonderful products! 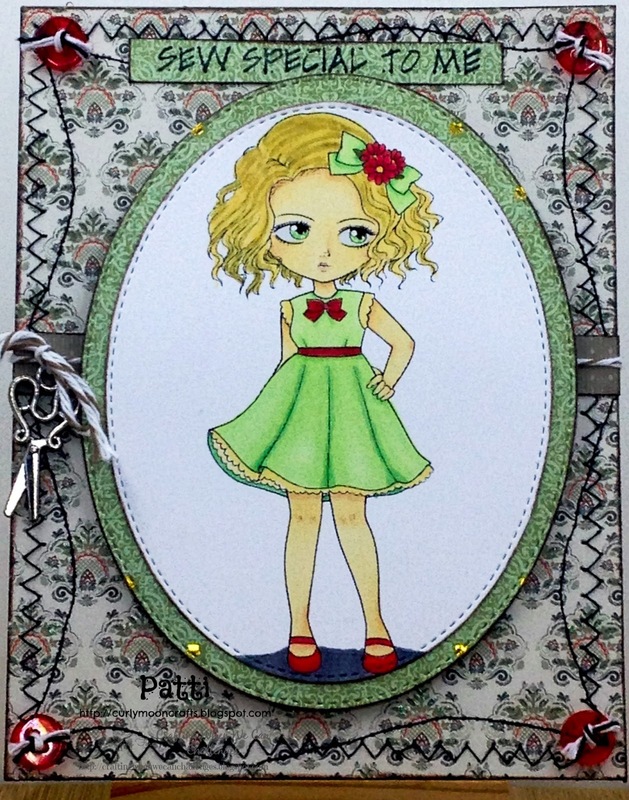 My creation for this week is a card using the darling image called Babydoll Dress Girl. I got as close to the color scheme as I could, and incorporated machine stitching, buttons, and a scissors charm to go with the sewing theme. Print image onto smooth white cardstock and color with Spectrum Noir markers. Use stitched oval die to cut out the image, along with a background oval panel from the patterned paper pack. Cut background paper to fit A2 card base, machine stitch along the edges, ink edges, and attach to the card base. Wrap baker's twine around a 1/2 inch strip of coordinating paper and attach to the center of the card. Ink edges of oval panel and use craft foam to mount it to the card center. Color clear buttons with the Spectrum Noir markers to match the colors in the image, add baker's twine, and attach to the corners. Make a baker's twine bow to attach the charm to the existing twine along the center of the card. To finish, stamp sentiment with black ink and attach to the top of the card.